Mario C. Gurrieri - Dughi, Hewit & Domalewski, P.C. Mario C. Gurrieri joined Dughi, Hewit & Domalewski in 2000. Mr. Gurrieri, a Senior Partner of the firm, limits his practice exclusively to all aspects of Family Law. This area includes all facets of divorce such as custody, parenting time, alimony, child support and equitable distribution of assets, pre-marital agreements, intra-marital agreements, post-divorce court applications due to changed circumstances affecting custody, parenting time, modifications of alimony and child support, palimony, paternity, change of residence outside the State of New Jersey, domestic violence and civil unions. Mr. Gurrieri has handled well over 1000 cases during his over 40 year career, which includes substantial trial experience involving both financial and non-financial issues. He also describes himself as a resolution oriented lawyer seeking to achieve superior results in as amicable and expeditious a manner as possible. Mr. Gurrieri has been appointed by Judges of the Superior Court to serve as a Standing Master (Assistant to the Judge) and Guardian. Mr. Gurrieri has also served as an Arbitrator for the Superior Court’s Early Settlement Panel since its inception nearly 40 years ago and has been recognized for his service. In that capacity he has arbitrated over 750 cases, thereby further adding to his experience level. He has also been appointed and serves on the New Jersey Supreme Court’s Ethics Panel adjudicating fee disputes between litigants and attorneys. Mr. Gurrieri enjoys providing services as a Mediator for those individuals who seek to resolve their marital dispute in that fashion. He received his Mediation Certification following his participation in the Superior Court’s Mediation Workshop Program. He finds this work most gratifying since it enables the parties to resolve their matter with a minimum of acrimony, stress and expense. Throughout his career, Mr. Gurrieri has been requested to deliver lectures and provide family law information at various seminars, and he continues to provide this service for the public. Recently he has appeared on Scotch Plains Public Access television presenting a symposium on divorce topics. Mr. Gurrieri appears in the following counties on a regular basis: Union, Middlesex, Monmouth, Somerset, Bergen, Essex, Ocean, Hunterdon, and Passaic. 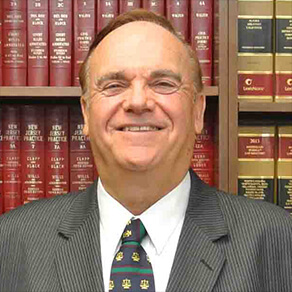 Mr. Gurrieri has been a member of the Union County Bar Association as well as the New Jersey State Bar Association, for his entire legal career. His personal background includes membership at the Colonia Country Club, including serving on its Board of Directors for 13 years and as its President for 2 years.